My thanks to Walter, a longtime Daktari fan from the Netherlands, for sharing this fascinating article about just what Africa, U.S.A. was all about. To begin with, like most things in Hollywood, it is actually not in Hollywood at all. It is located more than 50 miles northeast, almost surrounded by mountains, in beautiful Soledad Canyon. Here, in simulated “jungleland,” complete with “Zulu” villages, live more than 300 African, Asian and, in fact, world -wild animals-ranging from aardvarks, alligators and anteaters to Xiphosuras, yaks and zebras. 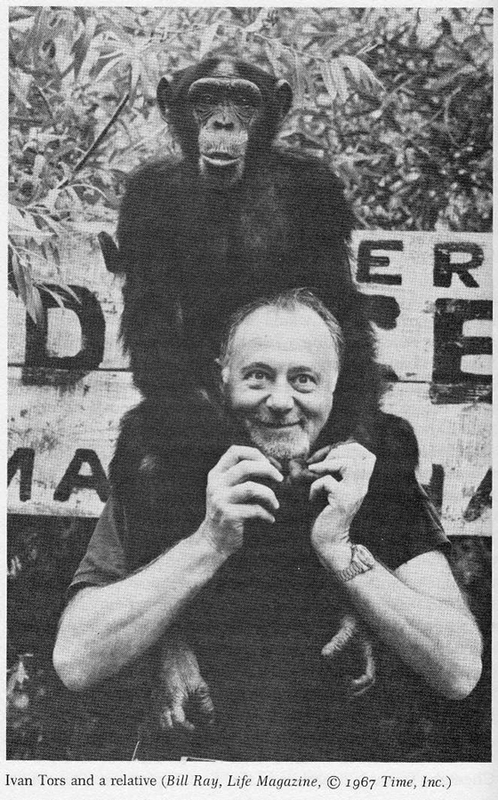 Founded by animal trainer Ralph Helfer, and now owned and operated by him in partnership with Ivan Tors (producer of Flipper), it is–now that the new acreage is operating–one of the world’s largest zoos, except, of course, that it isn’t really a zoo at all, because it is not open to the public and because a large number of its animals are never caged—even leopards and jaguars seem to roam about almost at will. Inside, in front of half a dozen floodlights, grinding cameras and sound trucks, you see a cross-eyed lion spring at a man. On another “stage”– equally surrounded–a chimpanzee is guiding a baby lion on the back of a crocodile. On still a third “stage” vu1tures crowd around while a cheetah attacks a hyena which is attacking Dina Merrill. Off in the distance, also surrounded, a rhinoceros is charging a station wagon filled with people. You’ll shake your head–and, as you do, a full-grown Bengal tiger jumps into a truck for what appears to be a coffee break with a very pretty girl named Cheryl Miller (she’s Paula, of course, in Daktari). But the most amazing thing of all is, even after the most ferocious appearing “fights,” the animals, the minute the camera stops rolling, break cleanly and come out playing. Today, to Helfer and Tors, this kind of thing is not only cruel and stupid, it is also not true. Even in the “Beverly Hills” section their animals are not to be confused with Park Avenue’s pampered poodles (“If we did that, says Tors, “we’d get spoiled animals”) but anywhere in Africa, U.S.A., the use of whip, chair or any other means of intimidation is strictly forbidden. One of Ivan Tors’ rules is that, even with the older animals, every one has personal contact with a human every day. “I feel,” he adds, it’s actually a physiological process.” Ralph Helfer adds that it is also a psychological process. “If an animal has only fear of you,” he says, “you can only go so far with him, You say, under the old method, you are going to bring him into your life—or else—and he may come. He may even come almost all the way. But not actually all. He’ll keep one door locked, and someday he’s going to explode and hurt you, or even kill you. But if from the beginning you’ve always gone to him in an entirely different way, with respect and affection, he’ll finally unlock that last door himself. You never know when. With an older animal who’s had ‘fear training’ it may be never. Only with the baby animals is Mr. Tors’ and Mr. Helfer’s process a relatively quick one—because, of course, these animals have never known a fear method. Actually, these animals fall under the distaff domain of Helfer’s beautiful wife, Toni. A former model, she has brought up her own baby girl, 2-1/2-year-old Tana, among the animals. 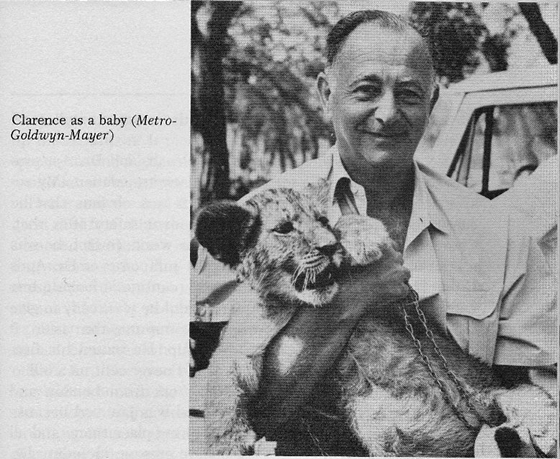 The hardest scene Mr. Helfer told me he ever had to do was a scene in the movie “The Lion.” Here the father was supposed to have shot his daughter’s pet lion, and the director wanted the lion to “die” in the girl’s arms. “On top of it all,” Helfer told me, they wanted it in a rainstorm. “I defy anyone,” he said, “to get that scene without our kind of training. How are you going to do it? To get the lion to go completely limp, with his tongue out, with not a movement—not even an eyelid? Of course, Zamba didn’t actually die—and, in time, he did get over the double-cross. But today he is dead, and, although there is a new Zamba in Africa, U.S.A., there is also, in the very center of the compound, a statue to the original. The legend is simple. “Zamba,” it says, “Friend to All.” Helfer points to it quietly. “I know it doesn’t sound right, but I got my religion from Zamba. Besides Zamba, the cast of characters in “Beverly Hills” includes Judy, the 3-year-old chimp who is tops in all the animal kingdom in what Ivan Toors calls “human” intelligence (he makes a sharp and not entirely favorable comparison between this and “animal” intelligence); Clarence, the cross-eyed lion (“He really does see double. We took him to the top eye doctor in the world, but nothing can be done about it”); Bruce, the ocelot in Honey West (“he’s actually very gentle, but he can act fierce enough to make the humans around him look brave”); Patricia, a 450-pound Bengal tiger, who starred in Disney’s “A Tiger Walks;” Bruno, a 7-foot, 700-pound black bear, perhaps the biggest “working” bear in the world and yet so gentle children can ride him; Sir Tom, a mountain-lion veteran of at least 60 movies; Raunchy, a 250-pound jaguar (“They said you could never train a jaguar. We didn’t—he trained us”); and, finally, Big Mo and Margie—Big Mo, a 4-ton, 50-year-old elephant who is the largest, strongest, and certainly the best actor in elephant history, and Margie, who is a small 7-year-old pachyderm who can do everything but talk. Once in a while ex-pets are taken n despite both Helfer’s and Tors’ strong opinions on wild animals as pets (they are 100 percent again it—“it’s all affection and no respect”), they turn out to be fine performers. The acid test of the effectiveness Of the Africa, U.SA. training came one dark and stormy night this winter. Thirty inches of rain, the heaviest downpour in Los Angeles history, washed out a flood-control dam, and before it could be restored, a second storm dumped 14 more inches, within 24 hours, on the area. The entire reservation was flooded–engulfed by waves with 8-foot crests and with power enough to splinter barracks into matchboxes, to overturn a 45-foot trailer truck, to pick up 1000-pound animal cages as if they were made of cardboard and carry them off down a river which had become raging torrent. So amazingly quickly did it all happen that Ted Derby and Frank Lamping, two head trainers, were both carried off nearly half a mile down the river before they were rescued. Once back, they, Mr. and Mrs. Helfer , Joyce Freeman, the general manager and other employees had but one purpose–to save as many animals as they could. At first their task seemed hopeless. Africa, U.S.A., had become a underwater arena full of confused, fear-crazed animals. In a few minutes, years of work were, it seemed, to go literally down drain. But then, that dark night, as they had done every day for so long under happier circumstances, they approached the animals. Toni Helfer made for the animal nursery and opened the door. The water-soaked, half-drowned, terrified young animals suddenly stopped their frantic fighting of the water and each other and fought to get to her. Carrying some, leading others and calling still others, she brought every single one to safety. Meanwhile the others approached the older animals–the lions, tigers, the leopards and the jaguars. Frightened as they were, the animals did not forget their lessons at Africa, U .S.A. There was no time to tie and pull them–they had to come, or else. Each sight of these huge animals being taken to higher ground, and safety, was more remarkable than the one before–a keeper, Jack Silk, carrying a cheetah piggyback across the river, literally swimming under him; 90-pound trainer Harley Tony alone carrying a 115-pound python, a snake that normally takes three men to lift. But perhaps the most amazing sight of all was Big Mo. For one of the trainers, unable to budge a cage sliding into the water had suddenly thought of the elephant. He had gone and untied him. Without a word of command, Big Mo went down to the river and set himself in position. A rope was put around the cage—and Big Mo pulled it to high ground. In all only four animals were lost—a new lion which had not yet had affection training and refused to leave her cage; a rare eagle from Pakistan, which had drowned, and two wolves which became so terrified nothing could be done to save them. A third wolf was, at least, freed frorn its cage. However, when a sheriff saw it swimming to freedom across the river to the wrong side, he refused to let it go. “I cannot allow it,” he shouted, and pulled out his gun. Immediately one of the trainers dove into the icy water and put his arms around the wolf, foiling the shooting. Nowhere though, that night when the storm subsided and they took stock, could anyone find Bruno. The 700 pound black hear was gone. Frantically Tors and Helfer advertised on the radio and television not to shoot him–that he was affectionate. Two days later, to the amazement of all, Bruno casually ambled back into camp and headed for his cage. He seemed none the worse for whatever experiences he had had—only tired–and to this day no one knows where he had been. ← Cheryl Miller’s first acting gig – at the tender age of nineteen days! 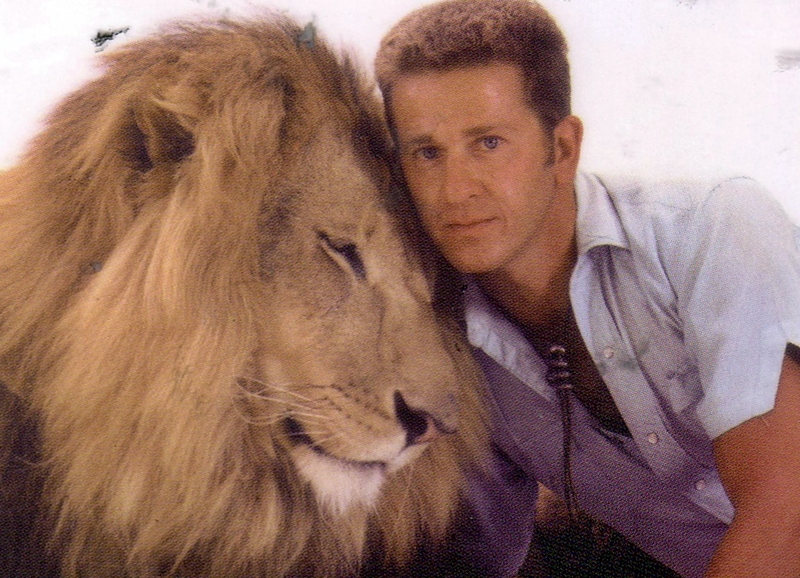 In digging up old articles about my favorite TV show as a kid, Daktari, I came across this fascinating story about Africa, U.S.A, once a large complex where exotic animals were trained through “affection training” rather than through fear with the whip and chair. This was back in the 1960s before caring for animals and the environment was fashionable. I direct your attention especially to the end of the article and the heroic efforts of the trainers, saving animals from imminent death because of raging floods. It’s quite amazing. This article contained a lot of interesting information, some of which I hadn’t read before. I had always thought the big flood at Africa USA occurred later than 1966 (specifically March 1968 – although this could just be an internet ‘urban myth’). Can any fellow readers of this website clarify this? Also does anyone know the actual location in Soledad Canyon where Africa USA existed? When I was planning a holiday to the USA in early 2012, I wrote to the people at the Shambala Preserve in the Soledad Canyon to book a safari tour and asked them whether Africa USA was ever located on the land which is now a part of their current reserve. Part of the response they provided included “….I am sorry to inform you that the property on which Shambala is on was never the same property as Africa USA. 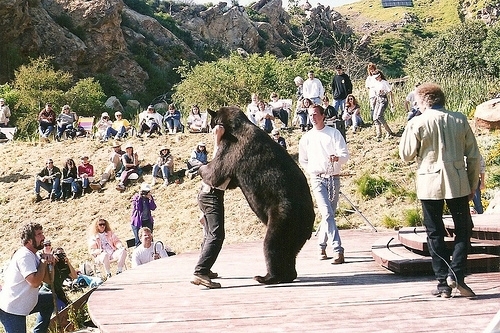 The property that Shambala is on was at one time owned by animal trainer Steve Martin and Ron Oxley. Both places suffered during the flood as well as the fire that happened in the late 70s. I have been a volunteer at Shambala going on 25 years now and have been asked about the Daktari property off and on. Some how people over the years have gotton the two properties confused.” If I ever make another trip from Australia to the USA, it would be a dream come true to visit the area of land that was ‘the Wameru Compound’ in DAKTARI or any of the recognisable landmarks used during the series (although I appreciate that the compound sets probably no longer exist). I just posted the question on my brother-in-law’s Facebook page because he lives out there and makes a point of knowing where these places are. I’m wondering if there were 2 floods because the article was written in 1966 and then there is reference on the web to the one in 1969 that wiped out the place. It makes sense considering how common flooding is in CA. As you drive up Soledad Canyon Road, Africa U.S.A. was located on the left side of the road. It was before Shambala Preserve. We had a house up on a hill directly across from the property that might help you locate it. There was no address. I have just finished reading Ralph Helfer’s ZAMBA book which I borrowed from the local library. It is a great read that really gets across his love of animals and his favourite lion, Zamba. In particular, it features a chapter of over 20 pages giving a very detailed and vivid account of the big flood that almost totally destroyed Africa USA in the 1960s. DAKTARI’s Clarence the lion, Judy the Chimp and Serang the tiger get a specific mention among the many animals affected by the flood. Also interestingly, he says that “‘we had just signed a contract with Universal Studios to open our beautiful ranch to their tours” but this obviously proved to be impossible due to the severe impact of the flood. Just imagine if there hadn’t been the flood – we all would still have the opportunity to visit ‘Wameru Compound’ today! Finally, Ralph makes a reference to “our home, across the street” which he mentioned in his email to me. Elsewhere in the book he refers to his house being a big Spanish-style residence (although that may not necessarily be the house opposite Africa USA). Anyway, I thought I might share this with you in case anyone ever has the opportunity to go to Soledad Canyon and the area that was once Africa USA. Maybe someone could take a few pictures of the area and post them on this website? It is a Camp ground Now called Ribins nest..You can see a House on a small hill to the left near Railroad Tracks then the Camp Ground..There is also 2 homes on the Right. I grew up in this area. And lived on a Ranch that they filmed Dactari on also.. If you drive on the 14 Freeway Antelope Valley Freeway get off on Soledad Canyon Make a Right.Drive Up a winding road the First spot you will see at the Bottom is an old Camp ground on the Right that was Called Rivers End. Keep going you will go through a Tunnel built in 1953 several Movies shot on this Road and theTunnel also Its a Mad Mad World.with Milton Milton Berele,. Keep going you will Pass Agua Dulce Canyon Road.on the Left..If you go up that Road Agua Dulce Canyon The California Kid with Martin Sheen was Shot there..But keep Driving up Soledad then you will Pass another Camp Ground on the Left White Rock Lake..
You will Pass a little store on the Left..then you will Pass the Fire Crew Area for the Forest and around the next Corner is Robins Nest Camp Ground on the Left this is where Africa USA Used to Be. .I was living there at the time of the Flood also and remeber the Animals all being loose. We moved in after Nature’s Heaven Owned By Ralph Helfer moved to Soeldad Later to be Called Africa USA.. The Owner of our Property Rancho Escondido was Rita Shaeffer Homesteders of the Aqua Dulce Area..This Ranch was originally 190 acres until the 14 freeway went through it..then it became160 acres it was also the Back Part of Vasquez Rocks another film Location. Our Family the Jones Family..Delbert,Diana Blaine,Bill David and Daniel we lived there and Restored all of the Buildings and Homestead homes returning it to it’s former Glory. .After this was Completed my Dad Delbert Made agreements with the Film Studios to film on this Ranch again..
Dactari, Lassie ,Gentle Ben,Cowboy in Africa..and also the first Cougar (Car) Commericals in 1968 were also Fimed there..and many other Films and Commericals.. I have Great Memories of this area along with My Brothers who all Live in Colorado now Im the only one left in California. And will forever have Great Memories of Aqua Dulce, Rancho Escondido Ranch , Vasquez Rocks. And all of my friends who I went to school with and Grew up with Many of who spent alot of time on the Ranch having Fun..
And all the People I met in the Fim Industry as a Kid. Wow! Although I live in Australia, I’ve been trying to find details of the location of Africa USA for some time in the hope of visiting it one day if I ever get back to the States on holiday. Your detailed description is so appreciated! Maybe in another post, you might like to provide any personal pictures you took at the time of the location as it related to DAKTARI. I actually often view a website about a similar DAKTARI-themed Australian TV show SKIPPY which has an extensive and well researched collection of then-and-now pictures of the show’s locations ( http://skippyproject.blogspot.com.au/ ). Wouldn’t it be great if one of our DAKTARI readers could do the same for our show! Wow, great information, thanks for sharing! Such amazing memories. I remember Little Africa. We stayed at a Girl Scout camp nearby one time and could hear the animals from a distance. Our family also visited Soledad Sands, the swimming park, a few times. We live in Lancaster, next to Palmdale, for many years. Hello again. I found a little more information about the floods at Africa USA in doing my research for “Gentle Ben”, based on California newspapers from the 1960s I accessed through Newspapers dot com. It seems like there were indeed two major floods. The first one, which is the one discussed in the Cleveland Amory TV Guide article, happened in Dec. 1965 and is the one that caused Bruno the bear (later the main actor in “Gentle Ben”) to be swept away. He returned on his own a few days later. Several other animals were also mentioned as missing but perhaps not drowned as the news articles mention that the chewed carcass of a cow was found, giving the impression that one of the big cats had eaten it. The second flood occurred in January 1969 and seems to have been much worse. Prior to this flood, Tors was planning to open the compound to the public for tours and had sought a zoning variance to do so. However, when the flood occurred the water rose so quickly that apparently not all the animals could be rescued from their cages in time, and were shot to prevent them from drowning. The animals that were shot included 3 lions, a jaguar, two tigers, and one or two bears (not Bruno as he went on to appear in 1970s films). Shortly thereafter, there was a $50,000 fire also at the complex, although no animals were hurt. After this, Tors decided to concentrate on his planned “Torsland” park in Florida (which I understand from the documentary on him, never happened, although he did have a number of his animals at the Homosassa Springs Attraction in Florida through the 70s) and Helfer decided to abandon the Africa USA complex and move the operation to a new location near Fillmore in Ventura County. It seems like in the “Beauty of the Beasts” account, Helfer (or some editor) conflated the two floods as the article talks about shooting “Gentle Ben” and then having Bruno wash away. “Gentle Ben” and “Gentle Giant” did not come out until 1967 which to me would mean that they were probably filmed during 1966 at the earliest (possibly even early 1967) so it seems unlikely that they were shooting “Gentle Ben” in 1965. Here are some of the newspaper sources I used. There are lots more than this on Newspapers dot com – the local California papers covered all of this in pretty good detail. “All you need is a Coke and stout heart”, Redlands Daily Facts, Dec. 31, 1965, p. 2. “Wild Animals on Loose – Swept away by Los Angeles Floods,” Eureka Humboldt Standard, Jan. 18, 1966, p. 2. “Three Dead Lions Reported Stolen From Africa, U.S.A.,” Redlands Daily Facts, Jan. 31, 1969, p. 3. “6 More Victims of South State Storm,” San Mateo Times, Feb. 26, 1969, p. 12. “Africa U.S.A. Fire,” Long Beach Independent, Mar. 4, 1969, p. A-7. “Tors Will Abandon Flood-Damaged Africa U.S.A.,” Fresno Bee, Apr. 13, 1969, p. 12-A. “HELP – They Don’t Quit,” San Bernarndino County Sun, Feb. 20, 1970, p. B-5. ” ‘Africa’ Opening,” Long Beach Independent, Jan. 26, 1971, p. A-8. GREAT information, thank you! I will have to make this into a blog post so that more readers will see it. I noticed when I posted the above that my previous comment seems to have not posted. I am guessing maybe this blog has an automatic reject for anything that contains a dot com or an address? Anyway, I had posted earlier to let you know that I did find in a 1968 paper an address for the original Africa U.S.A. complex that puts it on the left and ahead of Shambala, just as the previous posts said. I won’t repost the address as I don’t want the post to vanish, I’ll just say it was in the 8200 block of Soledad Canyon, Saugus. Source: “Action Line – Fun and Game,” Long Beach Independent, Jul. 1, 1968, p. 1. Obtained via Newspapers dot com. Someone had written in wanting to know where they could get training and a job working on a game preserve, so the paper told them to write or call Africa U.S.A. Hope this will help people looking for the correct site of the old compound. I was the Assistant Director on many of the Episodes. I knew Ralph when he lived in the Malibu Hills with his animals. I was 18 working in the Mobil Station on Cornell Corners and would fill Ralphs car with gas. Cool! Any stories you’d like to share? We could feature them as blog posts. in 1960 when i was working in my cousins Mobil station I went to a party at Ralphs home in Malibu hills. I did not know much about Ralph at the time except that I filled his car with gas all the time. When I arrived I was surprised to see all the animals in cages outside his home but I was much more surprised when I went in the back door to the Kitchen only to run into 2 Cougars with only a chain leash on them tied to two tree stumps. Other animals were in the home including a lion cub. I was only 19 and thought that was the coolest thing I ever saw until I worked on the show as the assistant director. It wasn’t work it was fun being around all the animals and Ted. My cousins daughters horse died. Ralph said “Can I have it?” Wow I thought, as I did not know he had animals. My cousin said sure and Ralph picked up the horse within an hour and fed him to the lions. 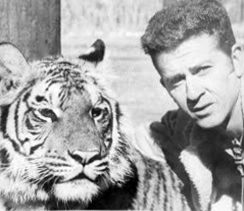 I liked Ralph very much and loved working with the animals especially Sarang the 500lb tiger. Funny I now live only 3 miles from where we shot the Daktari series at Africa USA. Im just off the Via Princessa off ramp on the 14 fwy. I saw Cheryl at the “Hollywood Show” at the Westin Hotel near LAX last year. I had heard the cast of The Waltons were going to be there so I went to see all of them as I worked on the show for 3 years as Production Manager and Producer. Wow, you have lots of great stories! Did Cheryl look well? I have so many stories Susan. My kids are trying to get me to write a book. I made over 200 films in 127 Countries with most all the biggest stars in Hollywood. You can see some of the films I worked on if you go to IMDB.Com and put in Lynn Guthrie. I was blessed to have worked with so many Great Directors and Actors. Two of my favorite directors were Billy Wilder and Mike Nichlos. Favorite Actress was Ingrid Bergman. We were very close. She was ill when we made A Woman Called Golda in Israel. I know for sure you can get an autographed picture of Cheryl. I had never been to one of those and the primary reason as all the living cast of “The Waltons” were there and I had not seen them in so long. We were all like family. My brother-in-law always goes to that show. I texted him last night to see if he’s going this year – he’d get one for me. I’m here on the East Coast. Nice site and great memories! I am Larry Titus. My twin brother and i got our start with Ralph in 1968 at the Africa USA ranch in Filmore Ca. Ralph gave us an unbelievable experience working around a thousands of animals. We got to work with many of the ones mentioned above and then some. I will mention a few, Harpi, Big Tom, Modoc, Serang, Zamba, Clyde, Clarence, Ridgerod, Roni, Naji, Bagdad, Margie, Burno, Ben, Major and hundreds more. We found that Ralph and Toni’s love and concern for animals extended to people as well. In 1969 when the park fell on hard times paying the bills became hard so many employees were let go. My brother and i were kept on but for very little pay. Ralph offered us his home in Soledad Canyon to live in free of charge for several months till the park was doing better. He then offered us jobs at Africa USA Bulletin Ca.where many of the animals mentioned above where located. One was Burno the famed bear. Bruno’s an my friendship was sealed permittedly when i noticed one day what looked like a large mat of fur deep in his fur around his neck. I found a old collar deeply embedded in his fur. I could not even move it, it being so attached. After about an hour of work with a pocket knife i removed it. Bruno instantly began to bounce up and down, rolling around and rubbing all over me. From that day on he would get up and rub all over the bars as i approached the area. What a great experience. If Ralph had not allowed my brother and myself such freedom to work with the animals Burno may have died slowly from it. In short time the park was sold but Ralph arranged so that my Brother Gary would be Head Trainer at Knox Berry Farm in LA and myself to be Head Trainer for Tiger Island at Marine World Africa USA in Redwood City, Ca. Thanks to Ralph we had a life of unbelievable experiences that very few will ever have. I did talk to Ralph a year or so by email and he is doing fine. Again thank you this site. 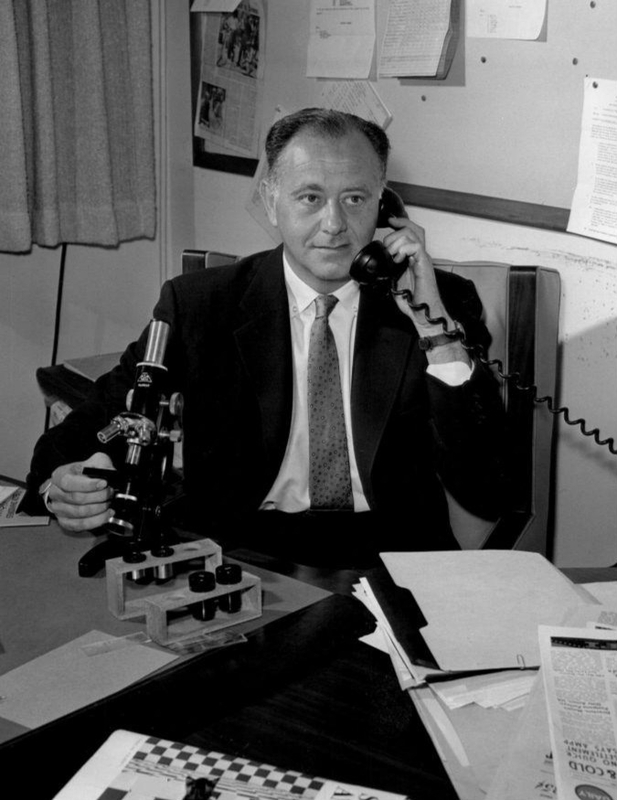 Ralph Helfer is a most unusual man — how lucky you are to know him and have worked with him. What great stories! Thanks for sharing. It’s wonderful gathering together people who have been so intimately connected with the show and the animals. Do you or anyone else have any pictures of Ralph Helfer, Toni Helfer, Tana Helfer, Zamba, Modoc, Clarence the Cross Eyed Lion and Judy The Chimpanzee they could upload to imdb.com? I have pictures of most everything you want – let me know how I can upload them. If you would like to upload photos to imdb.com this is what you do. IMDbPro subscriptions only allow uploading one resume and/or one set of photos per individual. Once you have entered the name of the person for which you wish to upload a resume or photos, you won’t be able to upload another resume or photo for another person unless you create a second IMDbPro subscription. If you wish to upload photos or a resume for several individuals, you’ll have to log-out and sign-up for a separate IMDbPro account (using a different email address). If you wish to sign up for a separate account with the same card you used for a free trial. About the 1969 flood, in witch way Zamba the lion saved the animals? It’s because of Ralph’s affection training Zamba safely led all of animals to high ground and watched over them. I have not! Thanks for that. Tonnes of Clarence with the chickens scenes are featuring Zamba! The long, pointy nose is a clue! I always wondered, who was the third lion after Clarence and Leo. How fun is that! You must have many stories. Perhaps you’d like to share a few for a future blog post?